Paxtonvic is nearly three years old. Paxtonvic was born in May 2009 and it has had 92,605 hits during that time. Thank you to everyone who drops onto the site, c 150 folk every day. I supose there is quite a ” library” of material on it now and if it helps people in anyway then I’m really pleased. Thanks too for the comments people send. Rarely they are unpleasant and usually very encouraging. Keep popping on! 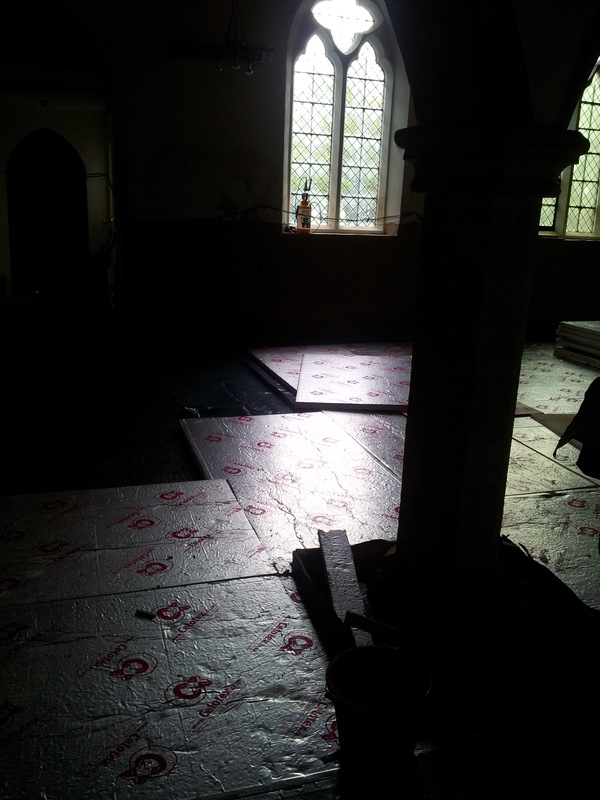 New pictures of the Little Paxton Church For Tomorrow Project – The Church begins to take shape! 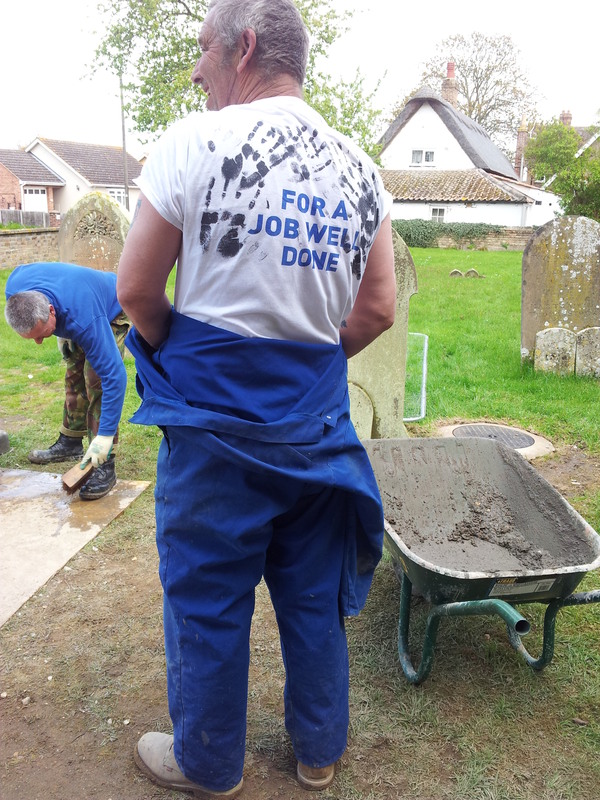 Phase Two of our Church For Tomorrow Project began in March 2012. 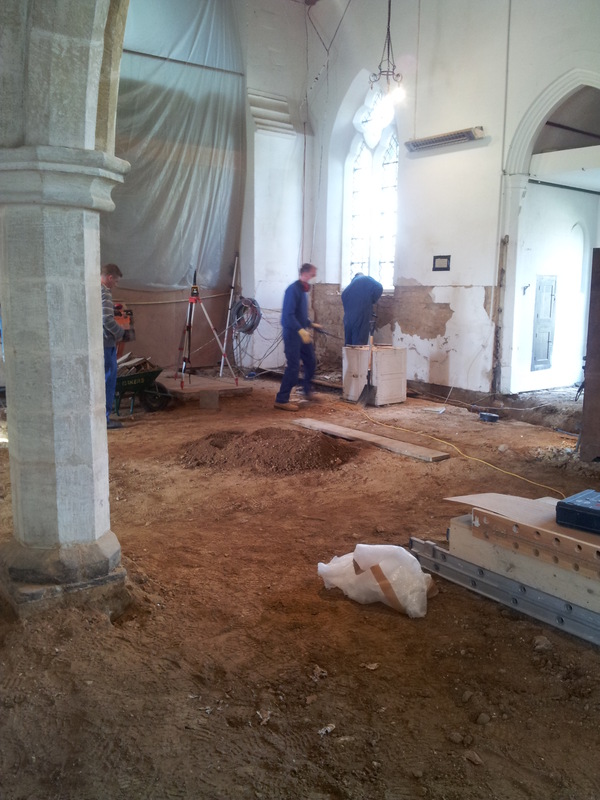 This followed some busy weeks when our faithful volunteers stripped out the church creating a wide open space for the re-ordering to begin. We have tried very hard to keep track of where everything is…. a lot of it in my study annex and the larger items up in the chancel or in a parishioner’s garage. First of all the floor had to come up and many tonnes of rubble and dirt were carted away to skips. More had to be taken away than we anticipated as there were so many areas of unstable rubble and sandy soil underneath. March 2012 looking west towards the north porch. 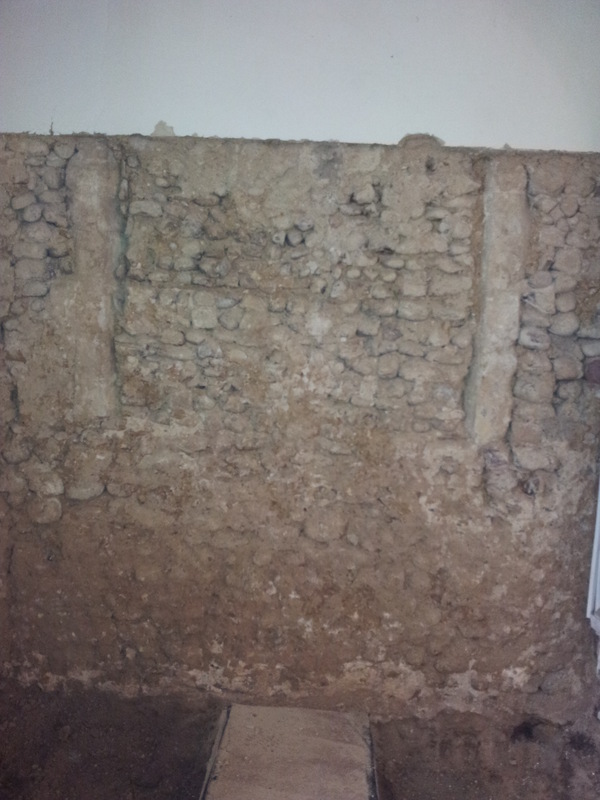 Plaster had to be removed from the walls up to a height of c 6′ approx. We found the outline of ancient windows at the west and east end of the south aisle. Outline of an ancient window at the west end of the south aisle. Very surpringly we also found evidence of some medieval wall painting though the black and red patterns seem to be directly painted onto the stones. 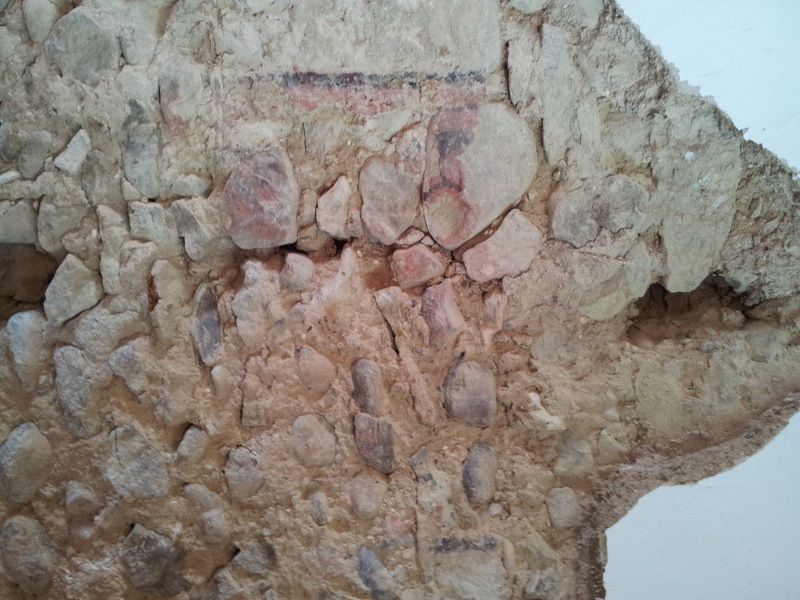 Wall painting fragments within a rectangular shape. For a few days the church felt very sad and it was hard to believe it could ever be out back together again. But Easter came along and the message of resurrection and new life was celebrated once more… …and now the interior is really taking shape. 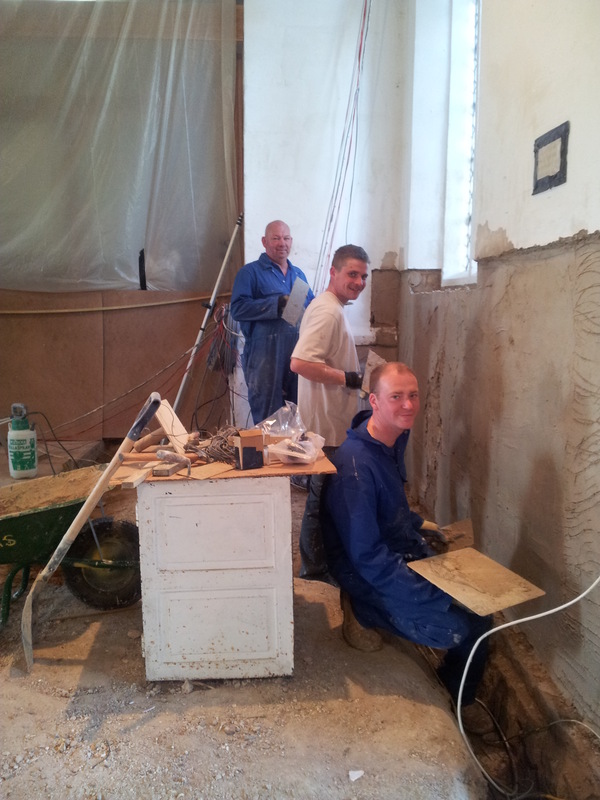 Bakers of Danbury lads at work replastering the north wall. Having dug deep to clear out the unstable materials, the work commenced April 23rd to create a new floor surface. First comes concrete layers. In just a few days you can begin to believe that by mid July the main work will be finished. 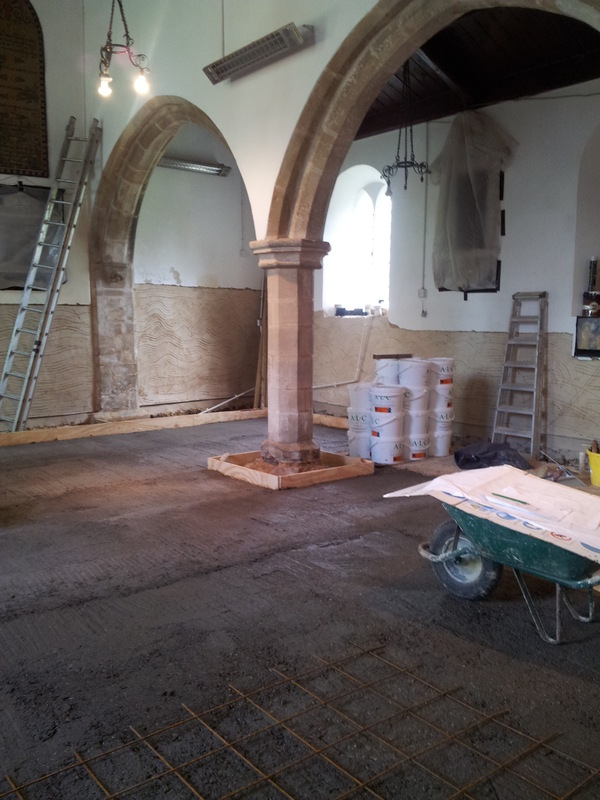 Im August the new carpet will be laid and the new oak chairs will arrive. There is still a lot of electrical and heating work to be done. We have a new gas supply and there will be insulation put into the roof. 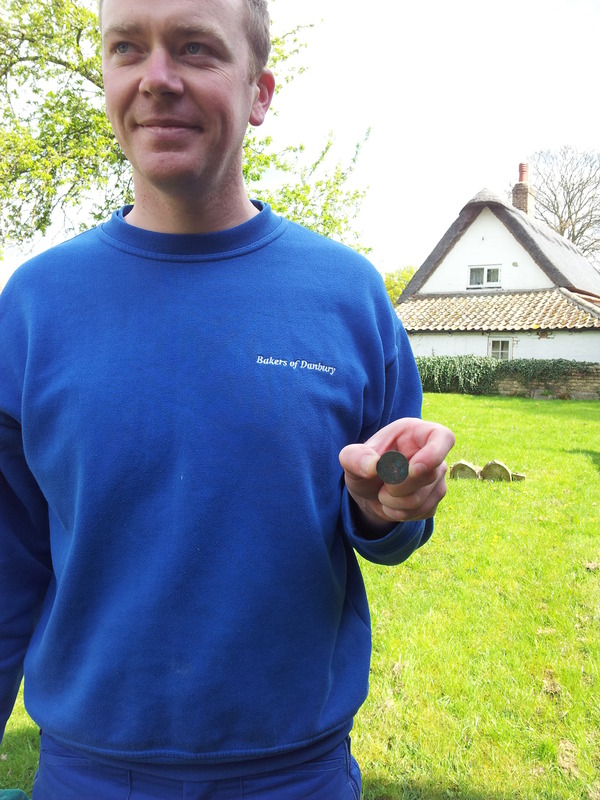 Hundreds of Victorian pamment tiles were recovered from under the damp carpet. They have been cleaned and will be relaid around the perimeter of the inner walls. We can’t thank Bakers men enough. They have taken great care with all they have done. It certainly is a job well done! I will post some more updates as the work progresses. Saturday April 21st 2012 late afternoon at Diddington on the A1 near to Little Paxton. 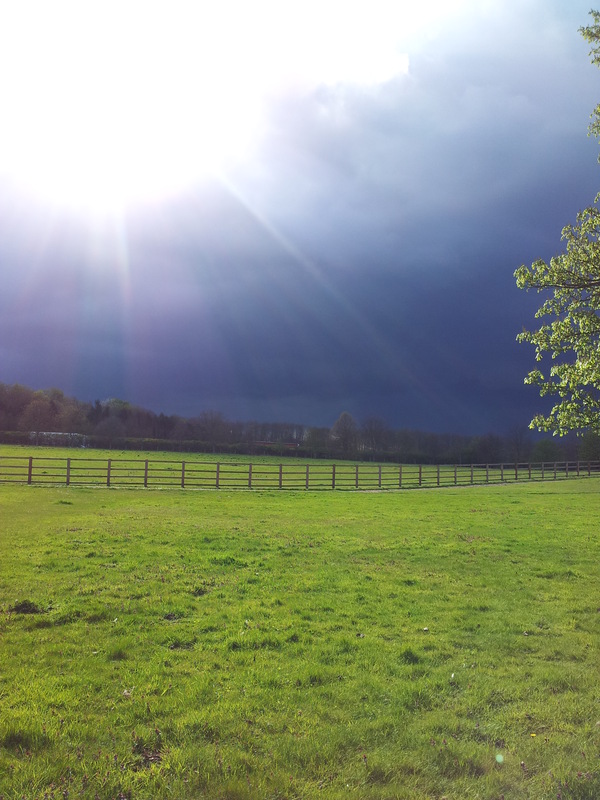 All of a sudden the sun came pulsing through a bank of dark cloud and I just caught it on my mobile phone. Click on the picture and a bigger image will come up. The juxtaposition of the cloud and sunshine remind me that so often life is a rich mixture of sunshine and showers, darkness and light and that one needs the other to define the other. 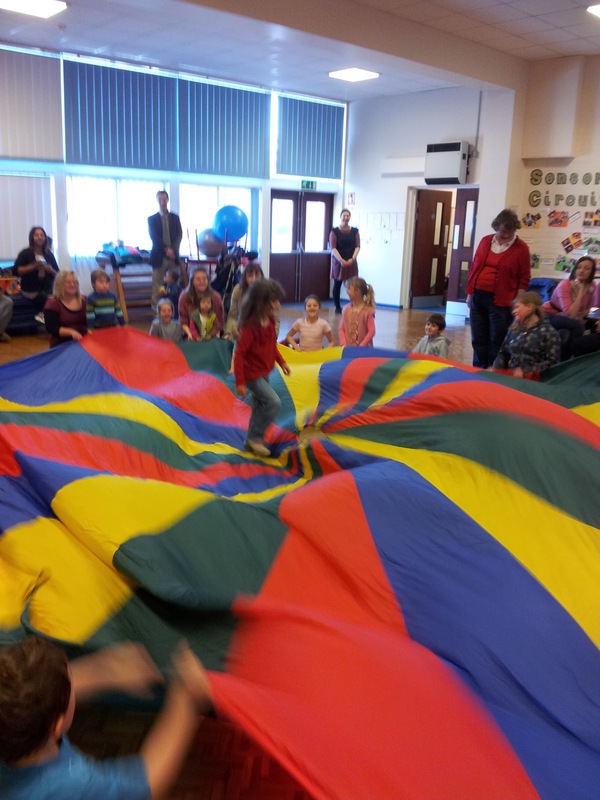 Love the bright colours of this parachute and the games we played with the children on Good Friday. Thanks to Ely Diocesan resource centre for lending it out. Never too late to post an Easter homily! 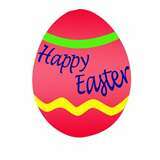 I hope all paxtonvic readers are having a blessed and joyful Easter season. Why on Easter morning of all times am I starting my sermon with a joke? Well, in the Eastern Orthodox Church Easter is traditionally a time to tell jokes. Easter, you see, is the time when God got the last laugh on darkness, fear, ignorance and death. However, we could be forgiven for thinking that if our shops are anything to go on, Easter is really all about chocolate eggs and bunnies, pretty spring flowers, fluffy soft toy chicks and getting on down there for Easter Monday sales when there is 50% off the kitchen you have always wanted. One supermarket has been reported as having had a notice up saying – Buy an egg and celebrate the birth of Jesus! For some of course belonging to faiths other than Christian, Easter would not have any relevance, though many do have a celebration of some sort with the coming of the spring. We must not forget our Jewish brothers and sisters who will be celebrating their Passover Festival in mid-April. However, even if it mostly happens behind closed doors ( but not for those who have an early morning sunrise Easter celebration) there are millions of people across the world in an upbeat frame of mind this Easter Day singing something about Jesus being alive. What on earth can this mean? A dead man in a tomb coming back to life? Surely its just a little bit of human fantasy in a world of such contrasting fortunes? Why does this man Jesus – who died a criminals death 2,000 years ago in Palestine and it is claimed rose from the dead – attract such attention still today? What is this “ Jesus is alive today?” story all about? It’s hard not to see it as a joke, a fantasy joke designed to take our minds off reality. But then maybe in some ways it is a joke that we celebrate today. In the sense that we are telling a story where the tables were turned on our usual take on reality. That first Easter morning, nothing is as it seems to be. St John tells us that Mary Magdalene, whilst it was still dark, whilst she was still consumed we can imagine with grief and confusion, arrives at Jesus’ tomb. She may have got there ahead of other women whose intention was to anoint his body with spices. Mystery number one: the stone had been rolled away. In shock and fear, she went runs to two of Jesus’ disciples and tells them what she has seen. Could they believe what this woman had said? Surely she was delirious, grief still had the better of her. They run to the tomb, each in turn look inside – there were the linen cloths that had been Jesus grave clothes rolled up neatly. They saw, we read and believed, yet did not understand – and went back home. Poor Mary is left alone, bewildered and crying. She looks inside for herself and sees two angels there who ask her why she is crying. “ Because they have taken away my Lord and I do not know where they have put him!” she replies. Then – so mysterious yet so tender – she turns and sees a man and maybe it is still her grief which prevents her from seeing the truth. She thinks it is the gardener and pleads with him to tell her where Jesus is. The risen Lord simply speaks her name “ Mary”. The Greek that follows is interesting – for he says to her do not continue to hold on to me because I have not yet gone back up to my father. In her exuberance she had clung onto him for a while before realising that although this was her beloved Rabboni – Teacher, in his new life he was different from before, although in essence just the same embodiment of God’s love. There followed, for all the gospel writers, many other appearances of the risen Lord to his followers before the day called Ascension Day when he disappeared from their sight. It was shortly after that, 50 days after Easter at Pentecost that his spiritual presence with them became an abiding and powerful reality. Do we really believe that Christ rose from the dead? What happens in our lives if we really believe? I believe resurrection is a reality. It is not simply an event that took place two thousand years ago that we look back at today with wonder and awe. I believe resurrection is a principle. It is the way God works. Resurrection means that there is a spiritual power all around us that Christians call the Spirit of the Risen Lord Jesus . The Lord is here “ His Spirit is with us” we shall say again in a few minutes. Do you believe that? Do you feel it? 1) Whatever we might be going through, or might have gone through so that we still bear the scars, or whatever fear the future holds for us – Christ’s risen life will sustain us. 3)Whatever sin, burden, guilt or resentments we may be harbouring, Christ will take those away if we earnestly seek his healing. 4)Whatever up hill battle we might be facing or black hole of uncertainty – the principle of resurrection life – new life in Christ- is always there to nourish us – not least through death. It gives the firmest assurance of hope possible. It steadies us when fear takes a hold and rejoices with us when the sun is shining. 5)Resurrection for me means meeting with Christ’s spirit in other people, seeing him at work in the unlikeliest of places – and when everything may on occasion seem bleak – hoping that all shall become well in Gods own time and in Gods own way. We are all invited to drink from the waters of Christ’s resurrection life. Today and every day of our lives. The way that the spirit of the risen Lord works in our lives and in our churches and in our communities will take as many forms as there are people and places and worshipping groups. There will often be surprises on the way – there certainly were for Jesus’ followers and at first they weren’t always seen as pleasant or welcomed. Yet whether in life or in death, his followers were so sure of Christ’s presence with them, they were enabled to live out the most incredible acts of Christian witness. I wonder what each of you would ask of the risen Christ this morning? What might new life mean to you? A renewed sense of comfort and solace from his presence? A new awakening to a sense of God calling you? A time for seeking more patience, more reflection, more guidance as to a future path to take? New energy to do good things? I wonder what your understanding may be of new life in our church here and in our Benefice. We had 60 or so plus children and adults at our Benefice Workshop on Friday – loads of energy and enthusiasm from the children and their carers, How good it will be to encourage that interest in the Christian story and follow up with regular activities that people of all ages can join in with. Our church in Little Paxton village is currently undergoing a transformation and we look forward to the new every day ministry we hope to offer based in an ancinet building with a modern mission. What paths may Christ be encouraging us to walk down next? I wonder how we may gain a renewed sense of commitment to the communities we live in? Faith isn’t just about what we do in our homes and in our churches, it has a lot to do with how we live our lives in community and enrich our neighbourhoods. So many of you have or still do play a vital part in the life of your local community. And sometimes it is so good to look beyond the confines of our village and towns to connect in real ways with those who may be rich in spirit but desperately poor in material ways which compromises their dignity. Jesus is Risen! He is risen indeed – Alleluia! It was no empty cry – no joke – for those first Christians – it was a vigorous cry of conviction and jubilation as more and more of them saw Jesus alive. When the time came for his resurrection body to disappear from their sight, His Spirit abided with them fully at Pentecost – His Spirit lives with us now. He is loose in the world. He’s there for you – for all of us- today and every day.. Christ is risen! He is risen, indeed! New Life. Peace. His Risen Spirit making all things new. That’s the Easter message. Alleluia! Ten Little Churchmen ( or women) ! It started raining – then there were nine. One overslept, then there were eight. Eight little Churchmen on the road to heaven, One joined a rambling club, then there were seven. One thought he’d like to go, then there were six. One bought a television, then there were five. The vicar upset one, then there were four. Over all the changes, then there were three. They chose a hymn they didn’t know, then there were two. The next ‘social evening’, then there was one. Got a friend to come to Church, then there were two. So their number doubled, then there were four. Till they got four others, then there were eight. Soon encouraged others troubled souls to seek. All the seats in church are filled, not an empty pew. Oh God, supply the grace and zeal in our Parish too. * Thanks to my oldest school mate Mary for sending this to me. 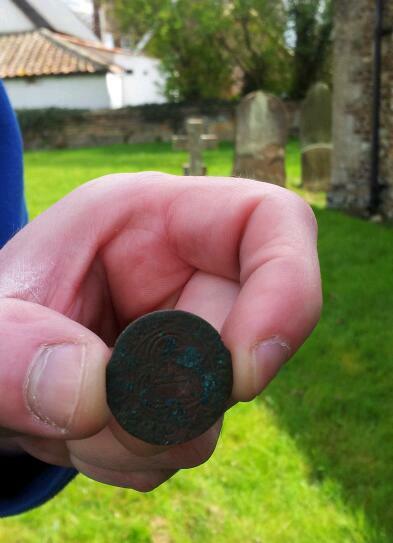 She found it when out walking in the countryside in the Coltswolds and visited some churches. She found the poem in one of them.